Successfully Added Teclast H30 Heart Rate Monitor - Calorie Counter, Pedometer, Call And Message Reminder, Weatherproof, OLED Display to your Shopping Cart. Increase your health and reach your fitness goals in no time with the Teclast H30 heart rate monitor. This sports wristband features an abundance of smart health tools through which it is able to coach and motivate you throughout all your future exercise sessions. 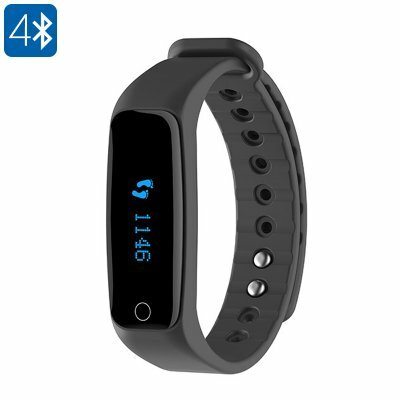 Thanks to its comfortable and stylish design, this Bluetooth wristband can be confidently worn at any occasion - making it the perfect health tool that, besides providing you with accurate workout data, can also be used as a casual wristwatch. Simply synchronize the Teclast H30 with your smartphone and it will constantly keep you updated about incoming social media notifications, text messages, and phone calls – assuring that you’ll never again miss anything important. This heart rate monitor can, additionally, be used in combination with the Tsports mobile application, allowing you to keep track and analyze all the data collected throughout previous exercise sessions. Along with its highly accurate heart rate monitor, the Teclast H30 Bluetooth wristband features a calorie counter, pedometer, sleep monitor, and distance recorder – providing you with a wide range of exercise data. With all this data available, this sports watch allows you to keep close track of your current fitness level and, additionally, provides you with all the coaching and motivation needed to get through your future exercise sessions. With this beautiful sports watch at your wrist, you can be assured that all your fitness goals will be reached in no time. Featuring a small yet beautiful 0.86-Inch OLED display, this sports watch constantly informs you about the date, time, and all requested exercise data. A miniature yet powerful 55mAh battery provides you with all the juice needed to get through 30 days of standby time – guaranteeing that it will never run out of power in the middle its coaching sessions. The Teclast H30 is perfect for anybody out there that is looking for a casual wristband that can be worn at any occasion and helps to motivate you throughout your quest of meeting your future fitness goals. The Teclast H30 heart rate monitor comes with a 12 months warranty, brought to you by the leader in electronic devices as well as wholesale electronic gadgets..